Conclusion: Should Conservatives Support Trump If He Wins The GOP Nomination? In the final installment of our series on what conservatives should do if Donald Trump wins the nomination we look at a final scenario and offer our recommendation on whether conservatives should join Trump or the Republican establishment at the Republican National Convention. Scenario #4: If Trump gets to 1,237 delegates, should movement conservatives join Trump in a unified conservative – populist ticket? We remain convinced that Senator Ted Cruz is the best candidate in the race and the most likely to govern and lead America according to limited government constitutional conservative principles. However, as the evidence mounts that the goal of the Republican establishment is to create so much chaos in Donald Trump and Ted Cruzadvance of the Republican National Convention that no candidate has a first ballot majority at the Convention, we think it is time for conservatives to consider all the alternatives, including what we should do if Donald Trump is leading at the Convention. While it is clear Donald Trump is no movement conservative, he is not necessarily an enemy of conservative policies, as we know Hillary Clinton and many establishment Republicans to be. Indeed, Trump’s record of flip-flops and turn-on-a-dime policy changes tells us that more often than not Trump likes to go with the winner and that on many issues that concern conservatives he is either ignorant or indifferent. So, on one side of the scale are principles and values, particularly the principles and values of our fellow cultural conservatives, and our desire to have leaders and elected officials who respect and live those values and principles. On the other side is the white-hot anger of millions of grassroots limited government constitutional conservatives and conservative leaning populists who are not only angry with the leadership of the establishment Republican Party, but disappointed and frustrated with many leaders of the conservative movement as well. The millions of disenfranchised country class voters who have been turning out for Trump look at the Republican establishment and see enemies who have been complicit in – if not the actual authors of – the three-decade long destruction of their quality of life. But they have not found relief through many of Washington’s conservative leaders, some of whom have often failed to even try to fight the government policies that have contributed to the degradation of our culture that is enforced by political correctness, the vast increase in the spending and the reach of the federal government and the hijacking of middle class prosperity by crony government policies on trade and immigration. Don’t get us wrong – Donald Trump’s lack of interest in many elements of the cultural conservative agenda is no small thing – that’s why we prefer Ted Cruz over Trump. But when faced with a choice between Trump’s lack of interest versus the deep and abiding hostility of Hillary Clinton, and the betrayals and lies of the Republican establishment, Trump’s indifference to much of the conservative agenda would leave us with a candidate who, unlike John McCain and Mitt Romney, might at least be educable. Country class Americans are now tired of politicians and conservative movement leaders who lecture them about the Constitution, but who do nothing to fight crime, improve education, prevent Islam from being taught in their schools, control the borders or encourage domestic economic growth. The country class wants change and an end to the misrule of politically correct elites who are indifferent to their plight, and they may very well trample anyone who gets in the way of that change – even those who have heretofore led the long fight against the progressive Big Government Republican and Democratic establishments. Into this environment barreled Donald Trump, who better than anyone else grasped how to channel this country class anger into a political movement. And “Trumpism” is not as alien to conservatism as some would like us to believe. Anyone who has read Phyllis Schlafly’s “A Choice Not An Echo” will recognize why the First Lady of the Conservative Movement endorsed Donald Trump. Mrs. Schlafly posited in 1964 that only by breaking the unseen powerbroker’s hold on power in Washington and the state capitals could conservative governance be achieved – and as the Reagan Revolution of 1980 and the Tea Party wave elections of 2010 and 2014 failed to bring about permanent change and government according to limited government constitutional conservative principles, she was right. Since 1980, while most Republicans run as conservatives, a majority of Republican Members of Congress have been co-opted into supporting open borders, amnesty for illegal aliens, trade deals that subvert American sovereignty and congressional spending that is so out of control and divorced from reality that it boggles the mind. The notion of movement conservatives joining forces with the establishment Republican perpetrators of what has become a near-treasonous sellout of our country – and the country class citizens who believe in conservative ideas and have fought for them for decades – would be an unforgivable betrayal and a disaster for the conservative movement. Moreover, conservative leaders who might wish to engineer such a rapprochement with the Republican establishment are rapidly losing the ability to do so because the grassroots have decided they will keep their eye on the prize – which is to defeat Hillary Clinton and the Washington Cartel. In Tennessee, Trump and Cruz delegates have begun to form grassroots alliance, and have agreed among themselves to support only the anti-establishment candidates. Many of the 49 delegates in Tennessee who are pledged to either Donald Trump or Sen. Ted Cruz will reportedly meet this month to seal a grassroots alliance in which they pledge their votes during any contested convention only to Trump or Cruz. 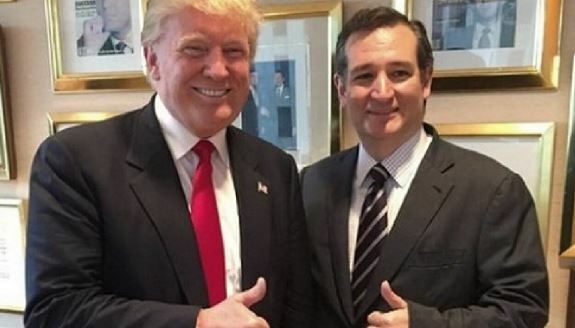 Rumor has it that such alliances are in the formative stages in other states as well – and the dynamics are obvious – in many cases those who are Cruz and Trump supporters have spent years battling the GOP establishment in their respective states and they are natural allies. There is no such natural alliance with the establishment Republicans who have lied to and betrayed these grassroots patriots over and over again. Of course one cannot dismiss the idea that the master negotiator will negotiate his own deal with the Republican establishment, but in the eyes of some of his strongest supporters this seems unlikely. To them the idea that Trump will form an alliance or reach an accommodation with the establishment would be such a deep betrayal of his most ardent supporters that it seems even less likely than the idea of a conservative #NeverTrump alliance with the Republican establishment. Why would conservatives not join with populists to harness their mutual passion for change? In state after state the Republican primary turnout has far surpassed the Democratic turnout. For example, in Michigan the Republican primary attracted a record 1.3 million voters, surpassing the previous record of 1.27 million votes cast in the 2000 primary between Arizona Sen. John McCain and then-Texas Gov. George W. Bush. While Democratic primary turnout has declined (except for 2008) GOP turnout, by contrast, has been relatively stable from 1980 through 2012, averaging about 10% of eligible voters in years with contested nominations and dipping to 7% or lower in uncontested years. While primary turnout isn’t conclusively predictive of general election results it is indicative of voter enthusiasm – and the enthusiasm is all on the side of the outsiders Trump and Cruz. Either Trump or Cruz has finished first or second in every primary or caucus, except DC. Through the first dozen primaries Trump alone booked more popular votes than the two leading establishment candidates combined; 7,542,328 vs 6,091,821 for Kasich and Rubio. Together Cruz and Trump have more than twice the establishment popular vote – 13,023,702 vs 6,091,821. Why would conservatives make a deal with the losers who have betrayed them and lied to them over and over? In a negotiation one has to make an offer to get a counter offer and so far conservatives aren’t at the table with Trump, even though the numbers indicate that a conservative – populist alliance is much stronger and more likely to defeat Hillary Clinton than an establishment – conservative alliance or an establishment – Trump alliance. There is no doubt that many cultural conservatives will find it difficult to vote for a man who is in many respects the poster boy for debasing American culture; we share that concern, and it is one of many reasons we prefer Ted Cruz to Donald Trump. This deep-seated discomfort with Donald Trump’s life-style is real, but from a strictly political perspective it does not constitute a reason for movement conservatives to abandon their natural populist allies to make a deal with the establishment Republicans whose misrule, lies and betrayals have created the present political environment and enabled the rise of Donald Trump. But what of establishment Republican threats to go Third Party if Trump obtains the Republican nomination? Again, history, in the form of the 1980 and 1992 elections is instructive. In 1980 the all-but-dead liberal Rockefeller wing of the Republican Party chose to walkout and back the Third Party candidacy of liberal Republican Congressman John Anderson against conservative Ronald Reagan. The liberal Anderson booked 5,719,850 votes or 6.6% of the vote while Reagan won a majority of the popular vote with 43,903,230 votes and 50.8% of the total. In contrast, in 1992, H. Ross Perot running as a conservative populist against the moderate Republican George H.W. Bush booked 19,743,821 votes or 18.91% of the popular vote. Bush was soundly defeated even though Democratic rival Bill Clinton did not get anywhere near a majority of the popular vote, booking only 44,909,806 votes or 43.01% of the votes cast. Looking at the 2016 exit polls and the historical evidence it is more likely that a walkout of liberal to moderate Republican voters would not defeat a unity ticket of conservatives and populists, but a walkout of populists in the form of a Trump Third Party candidacy or populists sitting out the election would most assuredly result in the defeat of the Republicans and the election of Hillary Clinton and probably a Democratic Senate. If conservatives form their own cultural conservative Third Party to oppose Trump in the General election they are certain to elect Hillary Clinton. If conservatives sit out the election they are certain to elect Hillary Clinton. Based on the historical evidence, the results to-date in the 2016 primaries and 2016 exit polling if conservatives make a deal at the Republican National Convention to deprive Donald Trump of the nomination they are certain to elect Hillary Clinton. The only scenario that does not, on its face, result in the election of Hillary Clinton is an alliance at the Republican National Convention between Cruz’s conservative delegates and Trump’s populist delegates who unite to guarantee that the two leading post-primary candidates are nominated as President and Vice President – as they were in 1980. Right now, the establishment’s goal is to sow as much chaos as possible in the lead-up to the Republican National Convention so that no candidate reaches the magic number of the 1,237 delegates necessary to win the nomination on the first ballot. We urge Donald Trump and Ted Cruz delegates to be smart about what is happening, keep their eye on the prize, which is defeating Hillary Clinton and dismantling the establishment stranglehold on our country, and to follow the lead of their compatriots in Tennessee by forming an alliance to ensure that the Republican National Convention nominates a conservative – populist ticket. Such an alliance would not guarantee a Republican victory, but like 1980 it would create the most competitive coalition of voters to defeat Hillary Clinton, and with a victory in November it would break the Washington Cartel’s stranglehold on America and preserve constitutional liberty for future generations. CHQ Chairman RICHARD A. VIGUERIE, is often called the "Funding Father of the conservative movement," transformed American politics in the 1960s and '70s by pioneering the use of direct mail as a means for conservatives to bypass the mainstream media. He serves as the chairman of American Target Advertising a 75-person direct marketing firm and of www.ConservativeHQ.com. The author of a number of books on politics and the conservative movement, Viguerie's latest book is TAKEOVER: the 100-year War for the Soul of the GOP and How Conservatives Can Finally Win It. CHQ Editor George Rasley is a member of American MENSA and a veteran of over 300 political campaigns, including every Republican presidential campaign from 1976 to 2008. He served as lead advance representative for Governor Sarah Palin in 2008 and has served as a staff member, consultant or advance representative for some of America’s most recognized conservative Republican political figures, including President Ronald Reagan and Jack Kemp. He served in policy and communications positions on the House and Senate staff and during the George H.W. Bush administration he served on the White House staff of Vice President Dan Quayle. Submitted by email_registrat... on Wed, 03/30/2016 - 00:43. Submitted by email_registrat... on Tue, 03/29/2016 - 21:23. I am a conservative but trump is not. He is for big government.He thinks he just has the right answers. He is for continued high taxes. He is for planned parenthood. I WILL NOT VOTE FOR THIS EGOMANIAC. I have never sat out an election in the past 42 years. I will this one if trump is the nominee. I have never had such an aversion to anyone in my life. He is vile and evil and I can not vote for him. Go on ,pile on me Like you have every other person that has the temerity to oppose the God of you people. Submitted by email_registrat... on Tue, 03/29/2016 - 16:13. Should republicans support Trump?? Definitely!! We want to get back to what USA used to be. The Establishment MUST not have control! Amen and Amen!! Submitted by email_registrat... on Tue, 03/29/2016 - 14:00. Conclusion: Should Conservatives Support Trump If He Wins The GOP Nomination? What kind of question is that? Isn't that THE reason for the primaries? Forget the questions; and get on with electing Donald Trump! Don't listed to the pundits; make up you own mind! Donald Trump is the breath of fresh air; we have been searching for! AND; GOD Bless Donald Trump!! Submitted by vsteele on Tue, 03/29/2016 - 12:29. If Donald Trump wins the Republican nomination conservatives must rally around him and stop the establishment from defeating the purpose. Donald Trump is everything that grassroots conservatives would want because he's a fiscal conservative who revitalize the economy and bring back jobs to America. He's also security conservative who will protect our borders and eliminate sanctuary cities where a lot of illegal aliens reside and defeat ISIS. Conservatives will support Donald Trump and will not give in to the Republican establishment demands to have a broker convention to deny Trump the nomination that won't work. It won't work with conservatives because they don't want Paul Ryan as the candidate to take the nomination. Donald Trump is favored by conservatives because of his conservative agenda he has for the country. Republican conservatives should join Trump at Republican convention if we want a certain future for the Republican Party and the Conservative movement. Submitted by email_registrat... on Tue, 03/29/2016 - 12:04. Submitted by chaplainpumc on Tue, 03/29/2016 - 08:45. If Trump reaches 1237, it is insanity not to support him. The same with Cruz. There are three candidates remaining in the race, and 2 of them have a reasonable expectation of either leading the other in delegate count or pulling even with them. Ideally, the party would force those 2 to run together as best it could, because their count would far exceed a majority candidate, so a majority ticket is the most logical fall back position. If one or the other would wish significant say on veep or cabinet rather than running himself, then that, too, would be an acceptable compromise, because it would again represent the huge majority of the party, and it would unite the party. I've no doubt that such a significant portion of the supporters of anyone perceived to have been cheated at the convention will back out of the election and try to find a different candidate elsewhere that it will spell doom for the Republicans in the fall. The warring factions must be honored. I don't think any amount of sophistry will heal the disrespecting of one camp or the other in time for the election. Submitted by jon exner on Mon, 04/04/2016 - 14:55. In response to chaplainpumc I agree If trump is nominated Cruz should be the vice-presidential candidate. After all I do believe that trump will be the first President of the United States of America to be impeached and removed from office by both parties. That will put Cruz in the Presidency where he belonged in the first place.